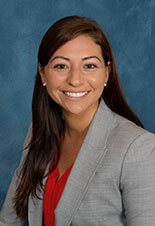 Courtney W. Gatesman - Corporate Property Group Inc.Corporate Property Group Inc.
Courtney was born and raised in Brevard County, FL. She earned her bachelor’s degree in Economics from Emory University and then returned to Florida to attend Florida State University College of Law. There she completed the joint-degree J.D./M.B.A. program. During law school, she was on the executive board for the Business Law Society as a Business School Liaison and received a Book Award in Condominium and Community Housing Law. She was also a member of the Women’s Law Symposium, Real Estate Law Society, and an active volunteer with the Refuge House of Tallahassee. Courtney is passionate about local community involvement and charitable outreach. She currently resides in Melbourne, Florida, with her husband, Josh, and their American Bulldog, Roxy.